General Admission: Includes free parking, access exhibition of arts and food for sale and free Raffle! Day of the Event/ Dia del Evento. Includes free parking, access exhibition of arts and food for sale and free Raffle! Minors of 12 years of age. ( 1-3 years old is free) It Includes free parking, access exhibition of arts and food for sale and free Raffle! There are two prizes round trip tickets to Argentina and that raffle box will be drawn twice, once for each prize. With each admission ticket, or increment your chances at $2.50 each will have a better chance to win!! * Program Subject to Change* No refund. Benefit School. Hay una rifa con dos pasajes de ida y vuelta a Argentina. Se sorteará dos veces, una vez por cada pasaje. ¡Con cada boleto de admisión, y, si lo desea incremente sus chances pagando $2.50 por cada uno y tendrá más oportunidad de ganar!!! There are two prizes round trip tickets to Argentina and that raffle box will be drawn twice, once for each prize. With each admission ticket, or increment your chances at $2.50 each will have a better chance to win!! Food for Sale 3:45pm to 10:30pm Indoor Launching the Argentine Beef and more!!! TICKETS DISPONIBLES EN LA PUERTA, SIN HAY DISPONIBILIDAD. COPA AIRLINES. Day of the Event also $2.50 Extra Raffle-ticket increase the changes to win! *Free parking *Free Access to Food area for Sale and Expositors area included in the admission ticket plus/raffle. Courtesy of Copa Airlines. $2.50 Extra Raffle-ticket increase the changes to win! * Doors open at 3:45p.m. *Show starts at 6:00p.m until intermission and from there to 10:30pm. 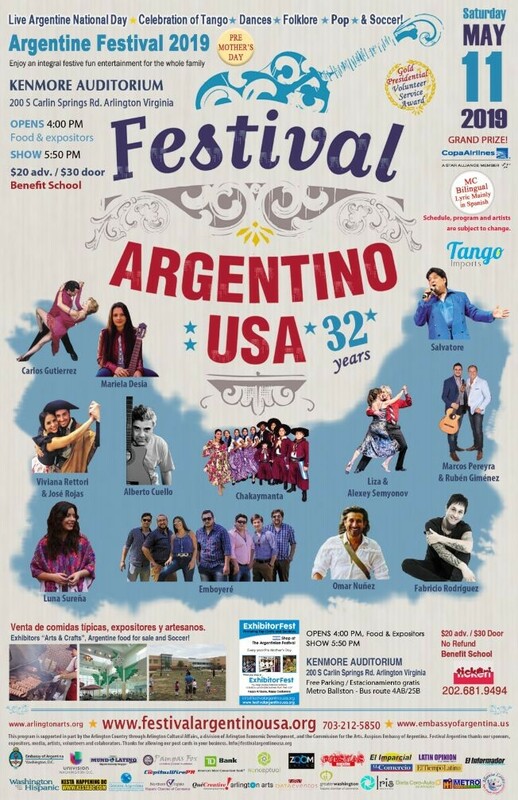 SPECTACULAR Integral Show of Tango, Pop, Folklore...soccer, exhibitors and food for sale!